WALTHAM, MA and BURBANK, CA--(Marketwire - August 12, 2008) - Lycos, Inc. (http://www.lycos.com), a leading provider of social publishing, media and search services, and ABC Family, today announced they will continue their successful relationship, with Lycos Cinema powering additional online viewing parties for the network's new hit television series "The Secret Life of the American Teenager." Dedicated to expanding its network and channel brands across multiple platforms and connecting viewers with their favorite shows anytime and anywhere, Disney-ABC Television Group's ABC Family and Lycos are teaming up once again to create unique online viewing experiences. 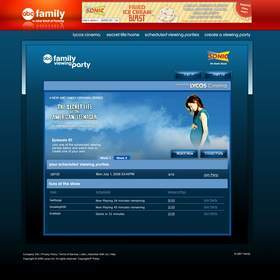 Beginning Aug. 13, fans of ABC Family's new hit series "The Secret Life of the American Teenager" can visit www.abcfamily.com or http://secretlife.lycos.com to watch episodes of the show simultaneously with others while chatting in real-time. Viewers have the opportunity to host their own viewing parties through Lycos's patent-pending, proprietary Watch & Interact video platform, scheduling private screening rooms online or meeting other fans of the show to watch current episodes of the popular ABC Family series. Once in the room, screening room hosts have complete control, with the ability to pause, rewind and fast-forward and discuss the episode with others. "By teaming with Lycos once again, we're able to continue to offer our communities of fans this unique, interactive viewing experience," said Vickie Collier, vice president, digital media, ABC Family. "Viewers of ABC Family are a very social and tech savvy group, and these online viewing parties are great new way for them to enjoy our programming and share that experience with friends, even when they are not in the same room." "Our experience in powering ABC Family viewing parties over the past year has proven fans have a strong desire to find new ways to interact with their favorite shows online," said Chuck Ball, vice president of sales and marketing for Lycos, Inc. "By providing simul-streamed viewing and interactivity across physical boundaries, ABC Family is giving their viewers a unique experience they can't find elsewhere." "The Secret Life of the American Teenager," a heartfelt one-hour drama which focuses on the relationships between families and friends and how they deal with an unexpected teen pregnancy, currently airs on ABC Family Tuesday nights from 8:00-9:00 p.m., ET/PT. The series boasts an incredible cast of characters played by Shailene Woodley ("The O.C.") as Amy, Molly Ringwald ("The Breakfast Club") as Anne, Mark Derwin ("The Bonnie Hunt Show") as George, India Eisley as Ashley, Kenny Baumann ("Eli Stone") as Ben, Daren Kagasoff as Ricky, Francia Raisa ("Cutting Edge 3") as Adrian, Megan Park ("Life with Derek") as Grace, Greg Finley ("Cold Case") as Jack and Jorge-Luis Pallo ("Navy NCIS") as Mark. Guest starring are John Schneider ("Smallville") as Marshall, Josie Bissett ("Melrose Place") as Kathleen, Ernie Hudson ("Ghostbusters") and Steve Schirripa as Leo ("The Sopranos"). Created and executive-produced by Brenda Hampton, the series is produced by ABC Family in association with Brendavision. Lycos first introduced its proprietary, synchronous Watch & Interact technology with the launch of its Lycos Cinema (http://cinema.lycos.com/) in 2006 as the Internet's first Community-focused video viewing platform. Relaunched in May of 2008, the new Lycos Cinema provides both paid and free ad supported viewing; expanded interactivity and scalability; and utilizes Adobe's latest Flash Server 3 Technology to deliver H.264 streams to provide the highest video quality and enhanced security features to its content partners. Lycos, Inc. (www.lycos.com) operates search and technology web sites that foster online communities, including the new Lycos Cinema community, bringing people together one flick at a time. Other Lycos products and sites include Lycos.com, Hotbot.com, Tripod.com, Angelfire.com, Gamesville.com, Lycos Mail, Webon, WhoWhere.com and The Lycos 50™. Lycos, Inc. is a wholly owned subsidiary of Daum Communications Corp., a leading Internet portal and e-commerce destination in Korea with a growing presence throughout the Asian markets. Lycos was acquired by Korean Daum Communications Corp. in October 2004 and has its U.S. headquarters in Waltham, Massachusetts. Daum Communications Corp. is traded on the KOSDAQ: 035720, www.daum.net.